Mars.Casino might not be a planet where bitcoin reigns supreme, but you can enjoy a full BTC betting experience if you wish. Although there are deposit/withdrawal options and games designed for other currencies, this casino does allow you to specify bitcoin as your preferred currency. 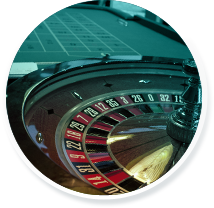 From payments to bonuses and betting, Mars.Casino is fully compatible with the world’s leading cryptocurrency. On top of this, you’ll find a healthy selection of promotions and rewards as well as an interface that doesn’t require you to have a degree in astrophysics to navigate around it. Sound interesting? Of course it does, so strap yourself in as we take you on a trip into bitcoin betting space. Board the Mars.Casino rocket ship and head into the darkness and you’ll find a site filled with hundreds of bitcoin betting options. Although the black background is in keeping with the “space” theme, it does make the site a little taxing on the eye. OK, so this doesn’t mean you’ll be straining to see the gaming options, but the decision to use a black background does make the interface a little unappealing on first inspection. The Top Games/My Favourites Carousel – At the top of the gaming grid you’ll see a special section reserved for the site’s top games as well as the ones you’ve highlighted (using the star icon) as your favourite. 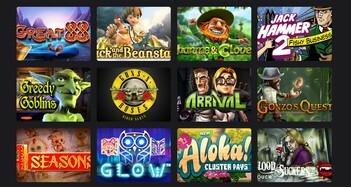 Being able to scroll through these games without having to touch the main gaming grid is a great way to get instant access to the best the site has to offer. Rocket Ship Return – It may be quirky and slightly unnecessary, but the fact you can click on a small rocket ship that automatically jets you back to the top of the page is a nice touch. I’m Feeling Lucky – If you’re new to the site or you just like to live on the edge, Mars.Casino offers a “feeling lucky” button. Clicking this will take you to a random game which is a great way to uncover a few little gems you may not have found under normal circumstances. Overall, Mars.Casino might be a little on the dark side, but the navigation process is highly efficient and the quirky little features help to make things a little more interesting which is great. The fact Mars.Casino automatically notes each bonus in your chosen account currency is fantastic news for players of all persuasions. A lot of online casinos that now offer bitcoin as a payment/betting option fail to do the necessary conversions. This typically means you’ll either have to claim bonuses in a currency other than bitcoin or you’ll have to hunt around to find the BTC conversions. Either way it can be frustrating which is why it’s nice to see Mars.Casino doing all the necessary sums for you. Drilling down into the specifics, Mars.Casino’s bitcoin welcome bonus is split into three parts. By breaking the deal down into stages, you’ll basically have to playthrough smaller amounts, which is easier than having to plough through a large bonus’s lager wagering requirements. Overall, the three-stage structure and the fact you only have to wager 40X the bonus amount before you can request a withdrawal make this bonus one that’s great for almost all players. While the overall value might not inspire high rollers, there are enough free bitcoins for the majority of players. When you combine with this with fairly lenient terms and conditions, it’s a welcome bonus that’s worth checking out. Reload Bonus – Receive a 25% reload bonus every Monday and Wednesday. Everyday Free Spins – Get 25 free spins after your third deposit (your three deposits must equal at least 0.1 BTC) of the day. Loyalty Bonus – Deposit at least 0.5 BTC every day for four days and Mars.Casino will give you 15% of your total back (up to 0.07 BTC) in the form of a bonus. Perhaps the most interesting aspect of Mars.Casino’s betting options is the fact you can play BTC specific games. However, because the site isn’t classed as a bitcoin only platform (i.e. you can deposit in multiple currencies), there are some games where you can’t bet in BTC/mBTC. But what if I want to play a game that’s not inside the BTC lobby and my account balance is in bitcoin? Well, the first thing you can do is click on a game and look towards the top right of the game interface. Here you’ll see a dropdown menu that allows you to choose the in-game currency. If bitcoin is an option, you’re good to go. However, if BTC isn’t listed, you’ll need to make a deposit in one of the valid currencies before you can access this game. Is that a slight pain in the proverbial? Yes, however, if you click on the dedicated BTC Games lobby, things are pretty straightforward. 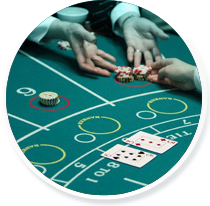 In fact, when you do this, you’ll get access to 235+ BTC casino games covering both the virtual and live gaming genres. After completing the sign-up and confirming your account via an official email link, you’ll be welcomed to the site with the message: “you’ve successfully landed on Mars”. Now, what’s also nice about Mars.Casino is that the all-knowing Vulcan Mr Spock is on hand to help at any time. Clicking on the live chat widget will call up Mr Spock who can help you with any and every issue you might encounter on your trip through space. These two products are known as some of the best in the business, but just in case you don’t want to take our word for it, Mars.Casino allows you to test them. Whether you want to use a third-party widget or the on-sign testing option, you can run various scenarios during a game to see if the results being presented are actually random and, therefore, fair. In short, if you’re looking for peace of mind, Mars.Casino has done everything it can to assure you things are safe, secure and fair. 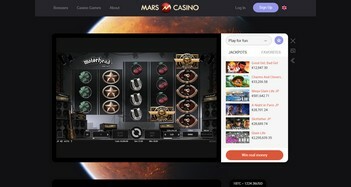 Mars.Casino doesn’t have its own selection of mobile apps, but you can access a “mobile” version of the site via any smartphone, tablet or even your desktop. Regardless of whether you’re using an iPhone, iPad, Android device, Blackberry or Windows Phone, Mars.Casino will detect your settings and switch its interface accordingly. Alternatively, if you want to get a feel for what the casino is like in a mobile setting, you can hit the “mobile version” desktop link at the bottom of the homepage and play in a more minimalistic way. Bitcoin is now a valid currency on Mars which is fantastic news for those that want 100% safe, highly efficient deposits and withdrawals. After selecting BTC as your account currency, you’ll be able to make instant deposits and withdrawals using Cubits. Either by scanning an onscreen QR code or using the following wallet address, you can move bitcoins to and from your account with ease: 3EnkNchkuBsd72u1zPtGjNgMSAJjec1HT3. If we do have one criticism when it comes to deposits and withdrawals at Mars.Casino, it’s that there is a fee. Deposits incur a 0.5% fee which isn’t typical in the industry and may put off some players. Additionally, the maximum amount you can withdraw is 5 BTC, which is slightly lower than other similar sites. Mars.Casino might not be fully equipped to offer bitcoin only betting, but it has done a good job of giving you a feel for it. Although it would be nice to have bitcoin betting options for every game on the site, there are more than 235 BTC specific games which should be more than enough for most players. 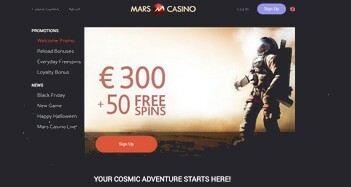 Beyond the games themselves, Mars.Casino is well structured, contains some unique navigation options and allows you to see all your bonuses and offers in BTC amounts. In short, if you want all the benefits of bitcoin casino gaming without joining a “bitcoin only” site, it’s worth taking a trip to Mars.Casino.